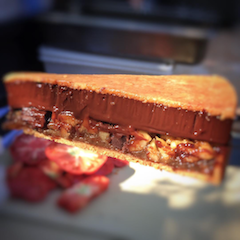 A slice of pie from Angela Pinkerton. Instagram photo by @iampinkerton. I have quite a lineup of coming soon news for you, so let’s rip through it. 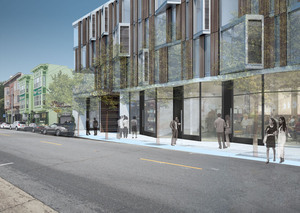 More news from the ~CHE FICO~ team, who are opening their project in a former auto body shop on Divisadero this fall. James Beard Award-winning pastry chef Angela Pinkerton will be opening a pie shop and dinette in the ground floor space next to Boba Guys (the restaurant, Che Fico, will be upstairs). It will be called ~THEORITA~, in honor of her grandmother. There will be sweet and savory pies, plus a grab-and-go counter for breakfast and light lunch. In the evening, there will be a dinette, with seating at the counter or in a dining room area. On the menu: Che Fico’s David Nayfeld will be offering a spin on diner food around the U.S. (one can hope for some Greek diner love!) and some of Pinkerton’s childhood favorites from growing up in northeastern Ohio will be repped as well. There will be natural wine and beer from California and the Midwest as well. I’ll keep checking in on this one since it’s literally around the block from me, yay. 834 Divisadero St. at McAllister. There is some ABC license transfer activity for Rose Pistola’s recently closed location, listing a DBA of Cantina di Liguria (considering Rose Pistola’s Ligurian focus, it’s hopeful). The new partners are Bonnie Fisher and Boris Dramov of Roma Design Group. Scoop reached out to them and received this tidbit: “We are looking forward to creating a new sociable gathering place that will build on the identity and traditions of North Beach but takes advantage of the innovations and evolution of the food culture that have occurred since Rose Pistola was first established 20-some years ago. We are taking the opportunity now to renovate the space and developing our concepts further.” Stand by for more. 532 Columbus Ave. at Green. There’s a project called ~BERBER~ coming to the short-lived Killer Shrimp (and previous TAPS) on Broadway in Russian Hill. Here’s a little teaser we found online: “Berber is an exotic North African fine dining establishment and opulent nightlife venue that offers world-class cuisine, blending the traditions of the Mediterranean with the best and brightest of California. Our guests are invited to an experience of elegant cuisine, impeccable service, and a unique ambiance of art presented in a modern context, while enjoying Berber culture and entertainment at its fullest joyful vibration of community.” The executive chef is Ali Dey Daly from Tunisia, and it sounds like there will be quite the lineup of entertainment. I’ll fill you in with more soon. 1516 Broadway at Polk. Dallas chef John Tesar is potentially opening one of his ~KNIFE~ steakhouses in SF in the Metreon at the end of 2018, according to Eater. The deal isn’t 100 percent confirmed, but it may take over the food court. Stand by for more. Coming to the Waterfront Plaza this May is ~NORCINA~, an Italian café and delicatessen from Kaitlynn Bauman of Levi Plaza’s Parlor 1255. Breakfast includes frittata, pancetta and cheese cornetti, and bombolini (think: Italian doughnut filled with pastry cream), plus coffee service by local Sausalito roaster Cibo. Lunch will have tigelle (a kind of Italian flatbread) sliced and filled with options like prosciutto cotto, stracchino cheese, and artichoke hearts (sounds like something I’d make at home, so yesssss! ), plus salads and housemade gelato. Hours will be Mon-Fri 7am-5pm. 50 Francisco St. at Montgomery. The folks behind ~THE GROVE~ said they were looking for another location after closing their location on Chestnut a few years ago. It looks like they found a spot in Showplace Square, and it will be opening this summer. 65 Division St. at Rhode Island. 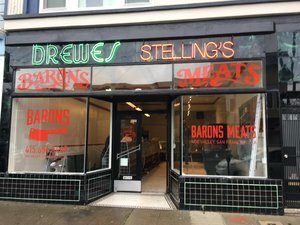 The spiffed-up exterior of Barons Meats. Photo via @baronsonchurch. The retail area of Taproot. Photo courtesy of BAMCO. A look inside The Night Market in SSF. Yelp photo by Dan F.
More meaty news: ~GUERRA’S TO GO~, an offshoot of Guerra Quality Meats, is now open, offering prepared meats that are hot and ready to go, like pulled pork, pot roast, and Northern Italian beef stew, along with lasagna, eggplant Parmesan, and potato and leek soup. Check out the menu and what’s available at different times. Dinner is ready! Open Mon-Fri 2pm-8pm. 345 Taraval St. at 14th Ave., 415-564-5201. 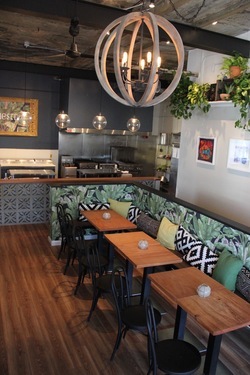 Yay: Deanna Sison Foster’s ~MESTIZA TAQUERIA~ is holding its super-soft opening and is now ramping up with lunch for the next two weeks. They will be open for their full hours the week of April 11th. Come by for consulting chef Sophina Uong’s taqueria-style menu, with flavors and ingredients from the Philippines, Cambodia, Thailand, and Vietnam. Here’s the first look at the opening menu. Dishes on the preview menu include tacos, burritos, or bowls (your pick) with Filipino pork adobo with ginger salsa cruda and green papaya achara; Khmer lemongrass chicken with avocado crema, peanuts, escabeche; and Thai red curry beef with pineapple-arbol chile salsa, roast shrimp powder, coconut flakes, basil. 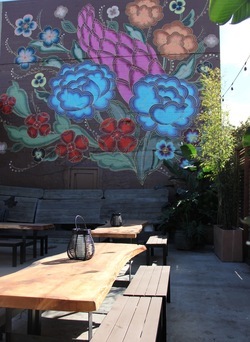 The weather is so nice this week, which means you can enjoy their patio (with that beautiful mural) and a cold beer cocktail or michelada, but the cute tropical interior is great too. More details are in my previous post. Open Mon-Fri 11:30am-2pm. 595 Bryant St. at 4th St., 415-655-9187. 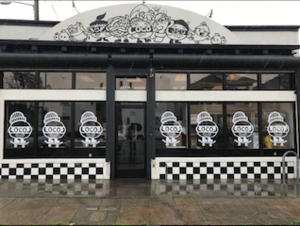 Mission Bay residents and workers: you have a new casual eatery and café to add to your neighborhood list. 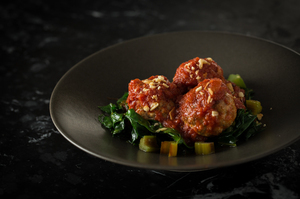 Now open is ~TAPROOT~ from Bon Appétit Management Co., the same folks behind nearby STEM Kitchen & Garden. Come in and order a custom sandwich with your choice of charcuterie and artisan cheeses, salads, and heartier Mediterranean-inspired entrées like porchetta with seasonal vegetable sides or something lighter like poached salmon. You can dine on-site (there’s seating) or get it to go. Since it’s like a deli, Taproot should come in handy for stocking your fridge or supplying a party or picnic. There are some pantry items, like honey, plus a selection of wine as well (including wines on tap). There’s also coffee service and espresso (they plan to open in the morning soon). Hours for now are Mon-Fri 11am-7pm. 409 Illinois Ave. at 16th St.
There’s a quirky little spot in the Castro that opened called ~ME &AMP; TASTY~, serving Thai rice plates, breakfast and brunch dishes, sandwiches, and more. Dishes range from omelettes to tea leaf salad to shrimp and grits to Thai red curry vegetables to fried chicken and waffles to shrimp tacos. When you have no idea what you’re craving, this place may be able to help you figure it out. Open Mon-Fri 10:30am-3pm and 5pm-10pm, Sat-Sun 8am-2pm and 5pm-10pm. 3970 17th St. at Hartford, 415-923-8498. 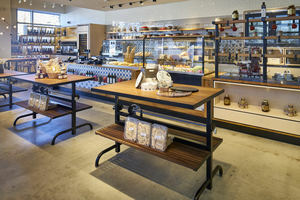 There is a second Noe Valley Bakery location that has opened in West Portal, ~NOE VALLEY BAKERY WEST PORTAL~. Hoodline reports it’s now open, and unlike the original location, it has seating so you can take a load off while you enjoy your croissant or cookie. Open Mon-Frid 7am-7pm, Sat-Sun 7am-6pm. 28 West Portal Ave. at Ulloa. ~BLUE BARN GOURMET~ has moved to a bigger location on Chestnut. It’s now in the former Barney’s, which means there’s more room and a patio where you can enjoy your salad. Open Mon-Fri 11am-8:30pm, Sat-Sun 11am-8pm. 3344 Steiner St. at Chestnut, 415-896-4866. 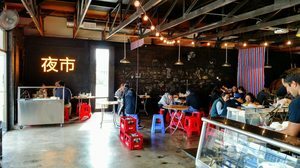 If you’re craving some Hong Kong-style street food, there’s a place that has opened in South San Francisco that sounds really fun: ~THE NIGHT MARKET~. The menu pays homage to the dai pai dongs (street food stalls) of Hong Kong, with curry fish balls, soy-marinated eggs, BBQ pork noodle soup, steamed buns, Hainanese chicken rice, and yes, Hong Kong milk tea. But here’s where it gets extra cool: the food is actually prepared at food carts/counters, and you sit at folding wood tables on red plastic chairs, beside a wall displaying images and sounds from night markets around the world (and movies). I will be checking this out ASAP (hello cheung fun with roast BBQ pork), follow me on Instagram for an update soon! It’s only open during the day for now, Mon-Sat 11am-2:30pm. 230B S. Spruce Ave. at Myrtle, 650-634-8388. The Rebel Within; photo by William Werner. The Rebel Within, the money shot; photo by William Werner. If you feel like playing around this Saturday April 1st (April Fools’ Day)—and I’m not talking about telling people you’re pregnant or you won the lottery or other tomfoolery—you may want to consider swinging by one of the four ~CRAFTSMAN AND WOLVES~ locations and order a Rebel Within. If you end up with one of the four Rebels without an egg inside (a Rebel Without! ), you win a free Rebel Within every month for one year. 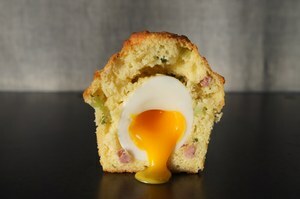 I know, if I bought one and didn’t have the egg inside, I’d be upset! But really, it’s a good thing. Swing by CAW Valencia, CAW Pacific, CAW Den, and the CAW Ferry Plaza Farmers Market stand. More breakfast fun: the folks at ~BLUESTEM BRASSERIE~ are serving brunch for dinner on April Fools’ Day. (I kind of love this, been waiting for someone to have a brunch for dinner restaurant for a long time.) 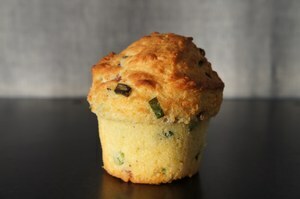 Chef John Griffiths will be serving their new cinnamon roll with brown butter-cream cheese frosting; Dutch baby with Comté cheese, bacon, caramelized apples, and fried rosemary; steak and eggs with a grilled bavette, charred herb salsa verde, griddled potatoes, and scallions; and a crispy buttermilk fried chicken sandwich with Calabrian chile aioli, bread and butter pickles, red onions, and Little Gems. You can even get a Bacon Bloody Mary with bacon-infused vodka, celery salt rim, and housemade pickles. Reservations or 415-547-1111.